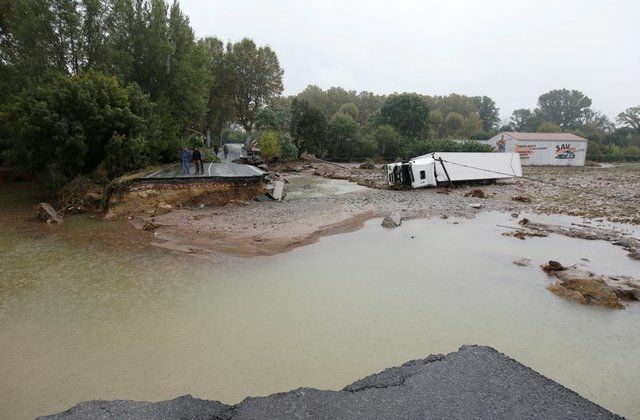 At least three people still missing on Tuesday after some of the worst flash floods in a century devastated towns and villages in France’s southwestern Aude region, authorities said. The government said it was spending millions of euros to revamp technology at the state weather forecasting agency, after some residents were quoted in the media raising questions about the speed of its alerts. Officials originally said 13 people died in the floods that raged from Sunday night to Monday morning. On Tuesday they revised the figures to 11 dead and three people missing. The downpours and floods hit a region near the medieval hilltop city of Carcassonne and dotted with stone villages on a sweep of land wedged between two mountain ranges and the Mediterranean. Mud-swamped village streets were strewn with upended cars and debris after raging rivers broke their banks. Water rose to the first floor of some dwellings. One of the worst-hit spots was the remote village of Trebes, where an Islamist attacker killed a gendarme and three people from the area at a supermarket in March. The equivalent of seven months of rain fell in a matter of hours while most people were asleep. Justice Minister Nicole Belloubet said the state would fund a new supercalculator that would help to “fine-tune” weather predictions and would be on line in a year and a half. She did not respond directly to residents’ questions in the media about whether the Meteo France forecasting agency could have issued its red-alert warning earlier on Monday, and whether that would have made any difference. There was no immediate statement from the agency. Environment Minister Francois de Rugy told Europe 1 radio station on Tuesday that there would be no cover-up if there were any shortcomings in the system, but that perfect prediction of such violent weather bursts was extremely difficult. “Weather forecasting is not an exact science,” he said.